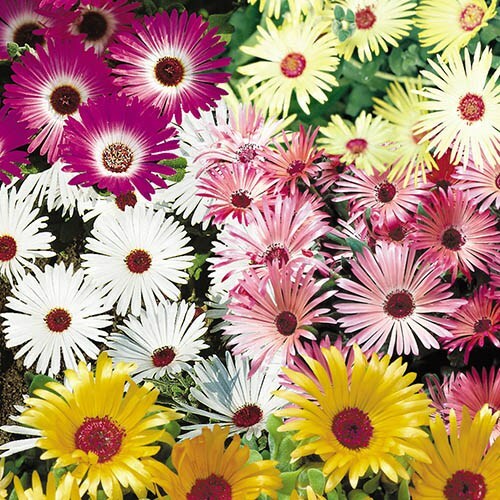 A fabulous 'Livingstone Daisy' that not only thrives in hot and dry conditions, but also flowers spectacularly in cool wet places and shady spots too! The lush, succulent, fleshy foliage covers the ground quickly, becoming covered in a rich explosion of colour all summer long. Winter hardy. A fabulous 'Livingstone Daisy' that not only thrives in hot and dry conditions, but also flowers spectacularly in cool wet places and shady spots too! The lush, succulent, fleshy foliage covers the ground quickly, becoming covered in a rich explosion of colour all summer long. Winter hardy. Height 15 cm (6').